In a compelling new set of interviews, Noam Chomsky identifies the “dry kindling” of discontent around the world that could soon catch fire. 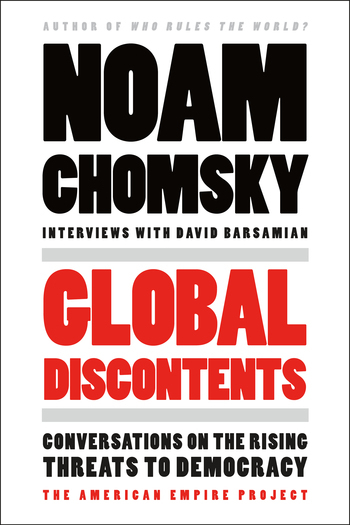 In wide-ranging discussions with David Barsamian, his longtime interlocutor, Noam Chomsky asks us to consider “the world we are leaving to our grandchildren”: one imperiled by climate change and the growing potential for nuclear war. If the current system is incapable of dealing with these threats, he argues, it’s up to us to radically change it. The twelve interviews in Global Discontents examine the latest developments around the globe: the rise of ISIS, the reach of state surveillance, growing anger over economic inequality, conflicts in the Middle East, and the presidency of Donald Trump. In personal reflections on his Philadelphia childhood, Chomsky also describes his own intellectual journey and the development of his uncompromising stance as America’s premier dissident intellectual. David Barsamian is the award-winning founder and director of Alternative Radio, an independent syndicated radio program. In addition to his ten books with Noam Chomsky, his works include books with Tariq Ali, Howard Zinn, Edward Said, Arundhati Roy, and Richard Wolff. He lives in Boulder, Colorado.